Nothing draws the eye quite like shining, gleaming black leather. It's the first thing you'll notice about these tall Chippewa Men's 71418 Black 17 Inch USA-Made Motorcycle Steel Toe Boots. But have we ever told you to wear something just because it looks good? Onc ... (see full details) (see specifications) #CHP71418. Nothing draws the eye quite like shining, gleaming black leather. It's the first thing you'll notice about these tall Chippewa Men's 71418 Black 17 Inch USA-Made Motorcycle Steel Toe Boots. But have we ever told you to wear something just because it looks good? Once you look past that shiny leather, you'll see what's really at the heart of these Chippewa boots: strong support. The 17-inch uppers of these American-made boots are crafted from polishable black leather that gleams and glows. Leather is flexible and feels soft despite its natural toughness. The material resists water and wind, and it cleans and shines right up when you need it to. Adjustable silver buckles, one at the top and one at the ankle of each of the black boots, help you get just the right fit when you wear them. The hardware is non-tarnishable nickel metal. More leather was used inside this men's footwear to create soft, comfortable interiors. The leather feels like luxury, but it's durable stuff that knows how to move with you. While leather surrounds feet, Texon cushions them. The lightweight Texon insoles of this workwear are on top of combination midsoles, made with 4 Iron rubber and 6 iron robus. The two materials are impact-resistant, made to absorb shock so it won't reach your feet. Triple-ribbed shanks add a core of strength to the design to support your feet. The shanks follow the bends of your feet to keep arches lifted and in place. This prevents muscle strain and pain that cause foot fatigue. High-performance rubber was used to create the support Vibram soles of these leather boots. Bouncy, shock-resistant rubber helps reduce stepping force to keep feet more comfortable. Goodyear leather welt construction was used to join the Vibram Nitrile yellow plug soles to the uppers of these Chippewa shoes. Repairable Goodyear Welt stitches are manufactured with waxed thread that resists moisture. The leather Welt is a thin strip of material placed inside that adds even more durability to the design. The safety toe caps are made with steel to resist painful, dangerous impact, and compression. The steel toes meet ASTM standards for protective footwear. These safety toe boots were made in the USA to keep your feet protected, comfortable, and safe. Chippewa Men's 71418 Black 17 Inch Steel Toe USA-Made Motorcycle Boots look like gleaming black leather, but they have a whole lot more to offer than that. Order yours today from Working Person's Store! These are by far my most impressive looking boots. 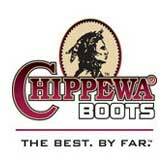 I would say these are the best looking boots in the Chippewa lineup. The fit is true to size, but make sure you watch the calf circumference since these boots are tall. I recommend using a thin sole insert to provide greater comfort if you will be in these for a long stretch, but you can be sure people will notice these boots. Chippewa Boots: Men's Steel Toe 71418 USA-Made Black Leather Motorcycle Boots is being added to your cart.